Alter The Press! 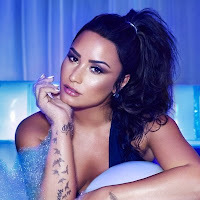 : Demi Lovato Releases New Single "Sorry, Not Sorry"
Demi Lovato Releases New Single "Sorry, Not Sorry"
Demi Lovato has released her new single "Sorry, Not Sorry," which can be streamed below. Coming off of a successful start to 2017, being named one of Time magazine's 100 Most Influential People in the Spring and teaming up with Fabletics for her own charitable athletic wear collection, Demi is also releasing an album later this year.